As an essential part of any building, early fire detection and warning systems are crucial in the preservation of life and property. 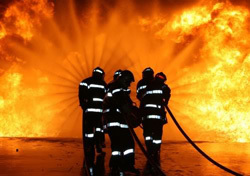 Each year many people die or are seriously injured as a result of fires at work, however when fire strikes, a business can be affected in so many other ways. Besides loss of life, fire costs UK business millions of pounds, from damage to property, loss of business, fines, compensation claims and insurance premiums. This startling truth means that over 90% of businesses who suffer a major fire incident never recover. Rest assured that our experienced Lynx fire safety team offer design, installation, commissioning and maintenance services to the highest standards. Clients wanting a cost-effective, all-inclusive bespoke service need look no further. Our fire alarms are individually designed, carefully installed, then comprehensively verified and commissioned. Highly trained and experienced personnel strictly control every process along the way. We offer a range of fire alarm systems from conventional “two-wire” systems to intelligent fully addressable systems.